White Paper Published By: Yottaa, Inc. 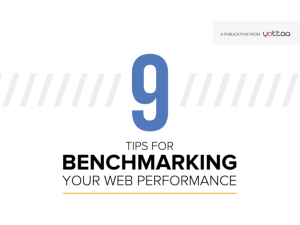 This guide presents 9 key tips to ensure you get actionable insights from benchmarking performance, including pictures, charts, bite-sized tips, and links to free tools to help you do it all! The guide will help you to understand how your site compares to competitors in your space, industry averages, and web-wide standards. We cover the basic metrics used to determine performance, such as Time to Interact, as well as some more granular metrics like Time to Start Render. Download the guide to start benchmarking today!